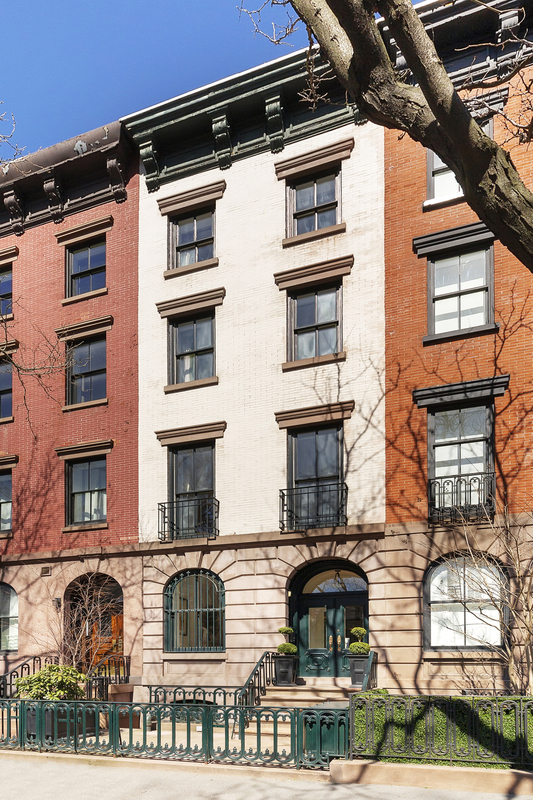 483 West 22nd Street is a five-story single-family townhome with a stately brick and brownstone façade. 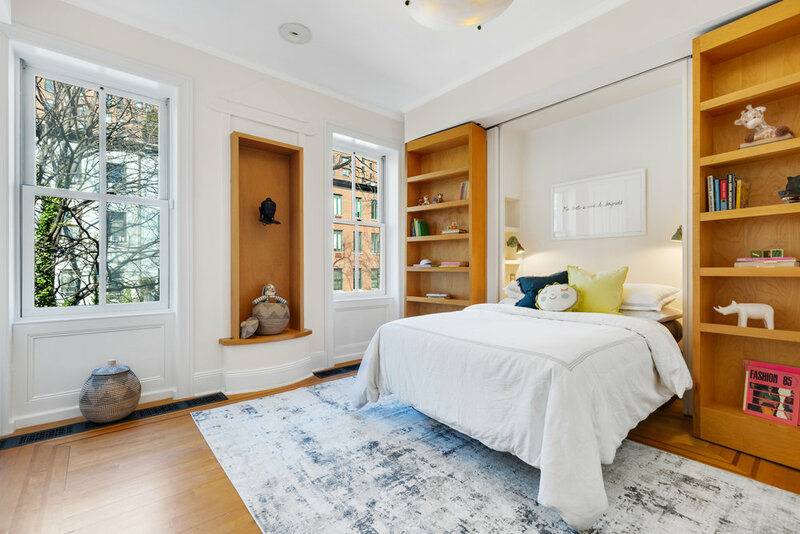 Built in 1856 and lovingly maintained, the house sits on a picturesque tree-lined street in the Chelsea Historic District, directly across from Clement Clarke Moore Park. The home is configured with six bedrooms, five and a half bathrooms, The kitchen may be open to the dining area or separated by a set of frosted glass sliding French doors. spread throughout the five floors. 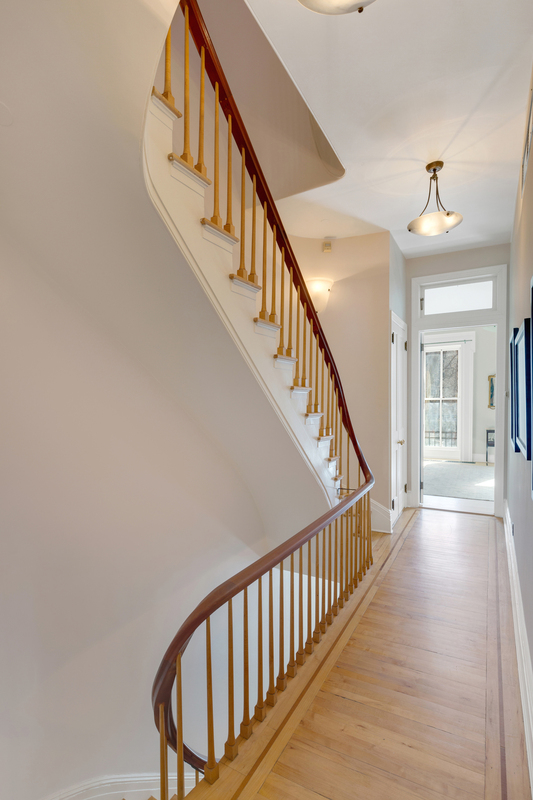 Complementing the pristine renovation are nine original wood-burning fireplaces and a grand banister and newel post staircase. Maple floors with walnut inlays elegantly flow from room to room, and custom lighting fixtures and curtain rods designed by Jerry Van Deelen, offer a unique continuity of style throughout. 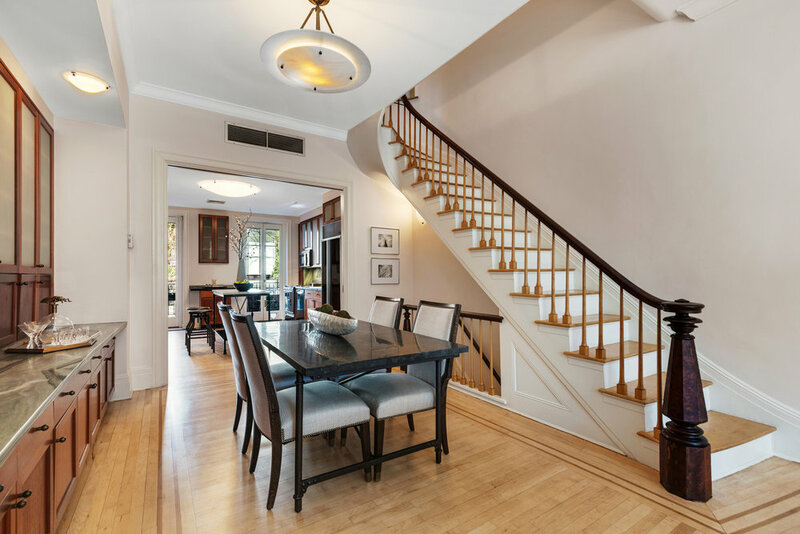 Enter the home through an imperial double doorway atop a wide brownstone stairway, flanked by elegant wrought iron railings. The Parlor floor invites you with a comfortable seating area by the marble fireplace, with sunlight streaming through the large arched windows. Gaze out at the park from the window seat. The home has unobstructed southern light and soaring ceilings. An open layout welcomes friends and family alike through the formal dining area to the large kitchen beyond. 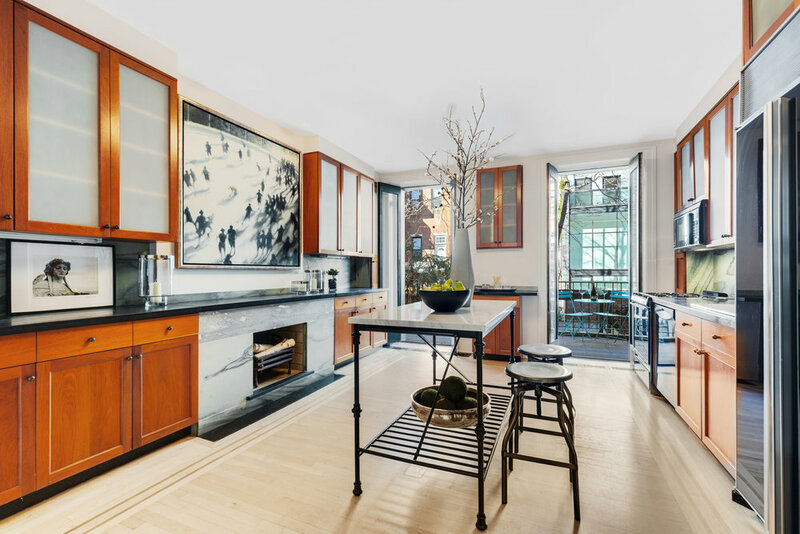 In the well-appointed kitchen, slate counter tops, frosted glass cabinetry, and a SubZero refrigerator give you the luxurious feel of modern living, yet the original dumbwaiter still serves the entire home. The kitchen may be open to the dining area or separated by a set of frosted glass sliding French doors. And two sets of French doors open onto a bluestone terrace where you can enjoy your morning coffee or evening aperitif, overlooking the sculptured garden and pergola below. 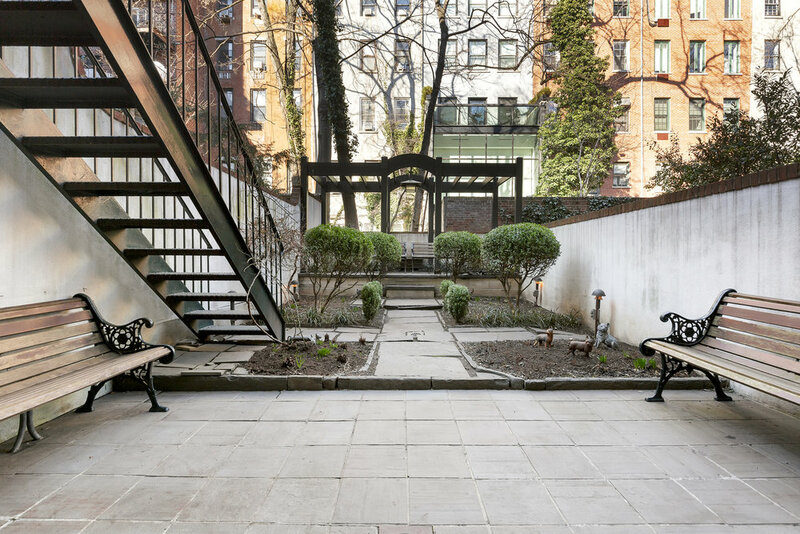 An exterior staircase leads down for convenient access to your private green oasis. The Master Suite occupies the entire second floor. 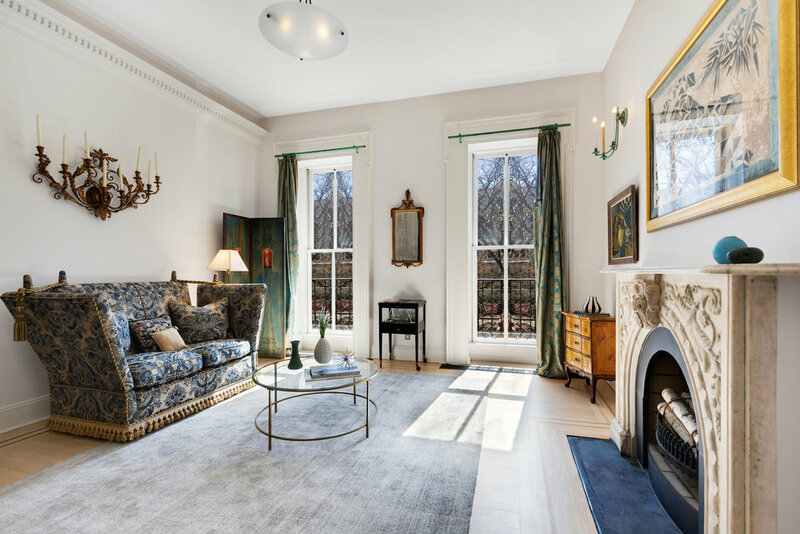 Up the gracious staircase, the king-sized master bedroom boasts high ceilings, its own marble fireplace, and oversized windows overlooking the garden. A walk-through closet and the master bathroom connect to a bright sitting room, easily usable as another bedroom. 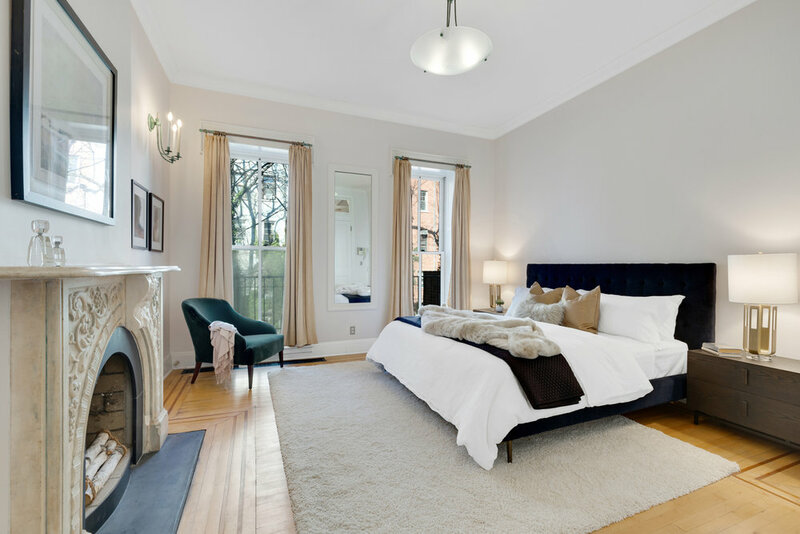 Up to the next level, we visit two additional large bedrooms, both with ample closet space and their own fireplaces. 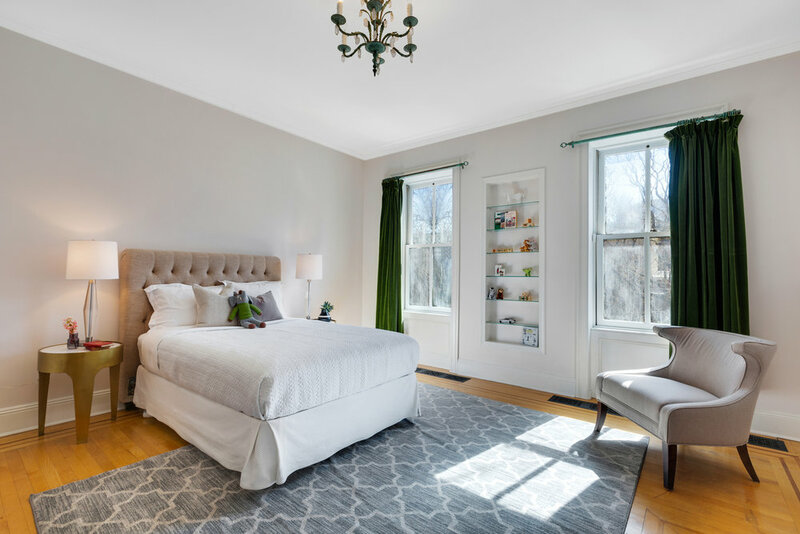 The front bedroom enjoys the park view while the rear bedroom overlooks the garden. Two full bathrooms complete this floor, so each bedroom has a bathroom all its own. 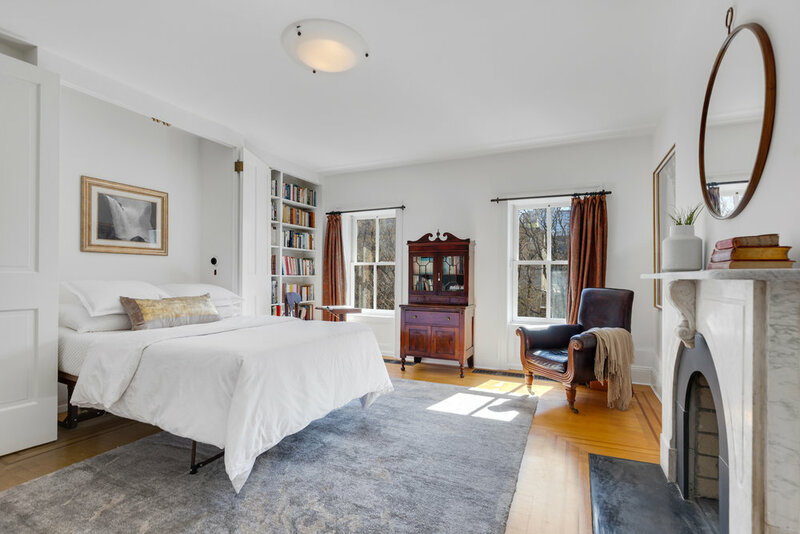 The top floor has another large, south-facing bedroom, with views overlooking the park and the Chelsea skyline. The rear bedroom has been subdivided into a guest room for your visitors and a spa room for everyone’s indulgence on the massage table. Another full bathroom, linen closet, and laundry room complete this floor. Up the spiral staircase, the roof level houses a utility room with mechanicals serving the home. 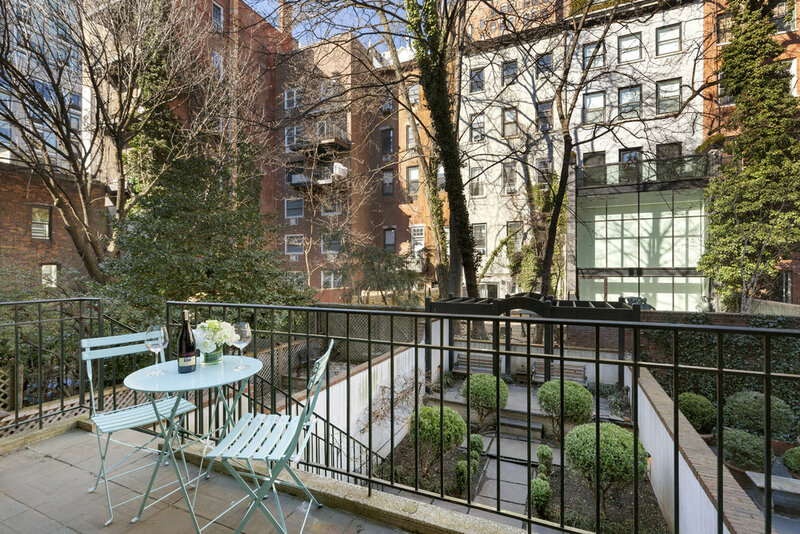 The rooftop is bright and open with glorious views overlooking the park and the Chelsea skyline. On the garden level, you are guaranteed to have a spectacular time! The front room has its own private entrance. Currently configured as a sitting area, this room can legally be used as an office or you may want to use it as another bedroom, with its own ensuite bath. The highlight of the garden level is the Clubroom, which opens onto the garden with a wall of windowed doors. 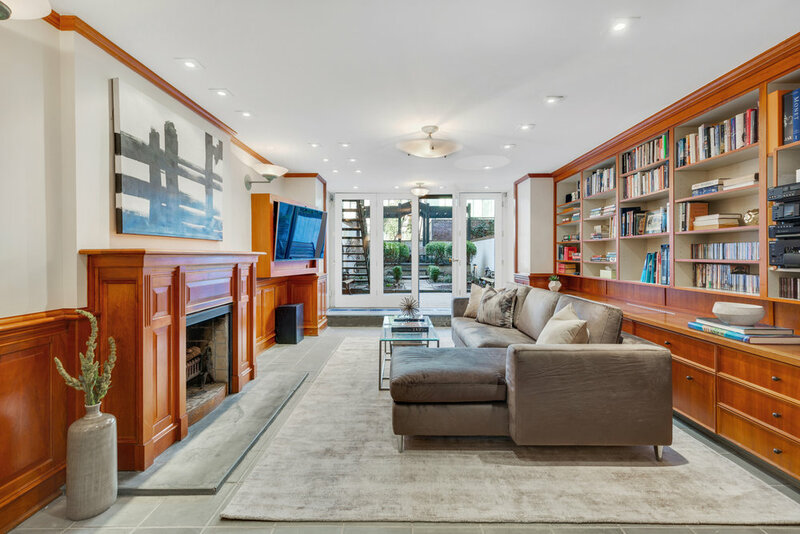 Here is where you will cozy up by the fire in front of the TV or with a good book, have a game night playing chess or cards, or host an elegant indoor-outdoor garden party. You simply won’t want to leave. Located in West Chelsea, this historic street is in close proximity to the Highline and New York’s most modern architecture. The Hudson River, fantastic restaurants, and easy access to the West Side Highway for weekend getaways are all within reach! If you appreciate modern elegance and pre-war charm, this is the home for you. 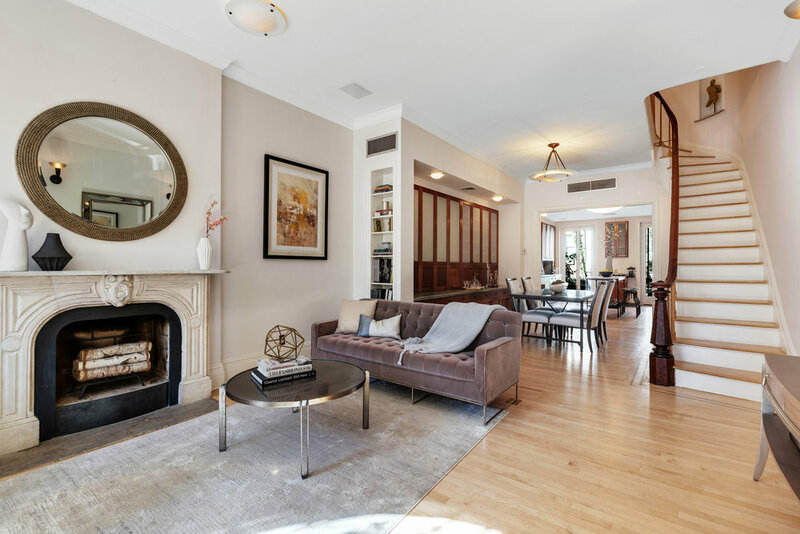 Treat yourself to a viewing at 483 West 22nd Street. Call today for a private tour.